"It is [the] Syria of the Western Hemisphere," he said. "We have the same actors: we have Russia, Iran and Turkey." "Add to this mix China plus FARC [Revolutionary Armed Forces of Colombia], ELN [National Liberation Army of Colombia], Hezbollah and 60 non-state actor groups — armed — acting against the civilian population," he added. According to Medina, Venezuela is drowning in a "proxy puppet game of thrones." "These militia groups are proxy puppets of Maduro, Maduro is proxy puppet of Cuba, and Cuba is proxy puppet of Russia." "We have all these anti-Western, anti-Democratic, anti-American rogue states challenging Brazilian, Colombian and the US sovereignty by applying asymmetrical warfare." He cited the "forceful displacement of 3.5 million Venezuelans" to neighboring countries as an example of asymmetrical warfare. According to Medina, what is happening in Venezuela is a fight between American values and "the evils of the world." "We, Venezuela, are the first line of defense of the American gateway," he said. "We will not go quietly into the night while our country's men, women and children are being silently exterminated by these proxy puppet of US, American foreign enemies." When asked whether a military intervention would be required to solve the ongoing crisis, he said that it would "most probably be necessary." "We are talking about major superpowers that have taken under a criminal syndicate our sovereignty and are running our country to try to undermine US authority in the region." Medina served as the Caracas ambassador to the UN for two years from 2015-2017, after which he split with Maduro. 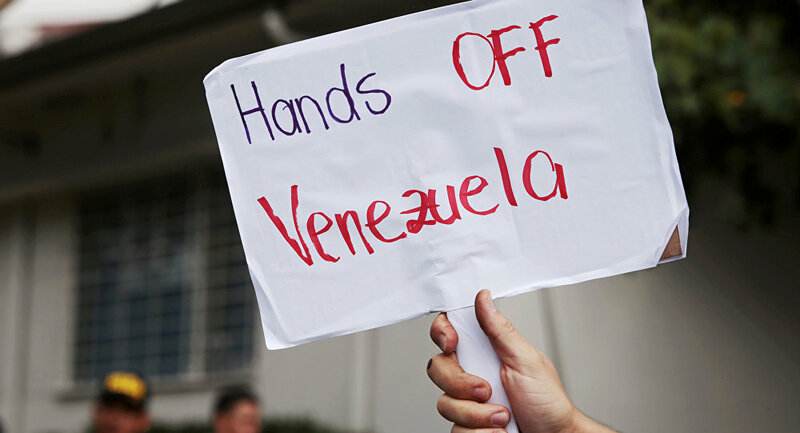 He was dismissed from his post after posting a video addressing the Venezuelan government to "stop the killings, to stop the violation of human rights, to reconsider and reflect on their position and think about the importance of the country as a whole." Rumbo Libertad (Freedom Route) defines itself as a libertarian Venezuelan political movement at the service of the Venezuelan Resistance, according to a Via News report. Medina described his movement as "top conservative civil resistance movement inside and outside Venezuela." "We are not afraid to use the word ‘Monroe Doctrine,'" he said in an interview Sunday. "This is a country in our hemisphere. It's been the objective of American presidents going back to Ronald Reagan to have a completely democratic hemisphere." Introduced in 1823, the Monroe Doctrine states that the US will view any attempt to take control of an independent state in the Western Hemisphere by a foreign actor as "the manifestation of an unfriendly disposition toward the United States."